Even as the government has been trying to shore up public sector banks through equity capital and other measures, bad loans written off by them between 2004 and 2015 amount to more than Rs 2.11 lakh crore. More than half such loans (Rs 1,14,182 crore) have been waived off between 2013 and 2015. Only two banks, State Bank of Saurashtra and State Bank of Indore, have shown zero bad debts in the past five years. In other words, while bad loans of public-sector banks grew at a rate of 4 per cent between 2004 and 2012, in financial years 2013 to 2015, they rose at almost 60 per cent. The bad debts written off in financial year ending March 2015 make up 85 per cent of such loans since 2013. The RTI reply also disclosed that bad debts have declined only four times since 2004. The last time was in 2011. An analysis of the information available with the RBI till 2012-13 also shows that between 2009 and 2013, both the advances by public sector banks to individuals and business entities as well as their amount of bad debts written off doubled. From 0.33 per cent of total advances in 2009, bad debts rose to 0.61 per cent in 2013. Bank-wise break-up shows State Bank of India, India’s largest bank, is way ahead of others in declaring loans as unrecoverable, with its bad debts shooting up almost four times since 2013 — from Rs 5,594 crore in 2013 to Rs 21,313 crore in 2015. 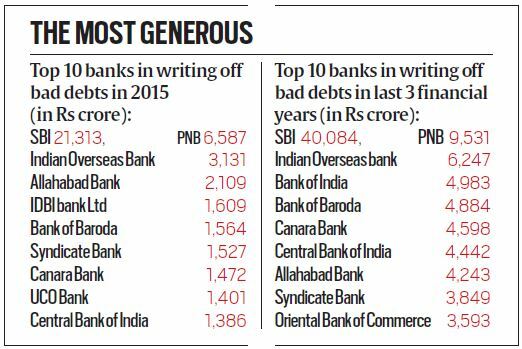 In fact, SBI’s bad debts made up 40 per cent of the total amount written off by all other banks in 2015 and were more than what 20 other banks wrote off. In 2014 too, the bank’s bad debts alone comprised 38 per cent of the total of all banks. The figure of bad loans for 2014 and ‘15 combined, Rs 34,490 crore, was Rs 10,000 crore more than that for between 2004 and 2013, Rs 23,992 crore. The country’s second-largest public sector bank, Punjab National Bank, has also witnessed a consistent rise in bad debts since 2013. These grew by 95 per cent between 2013 and 2014 but climbed by 238 per cent between 2014 and 2015 — from Rs 1,947 crore in 2014 to Rs 6,587 crore in 2015. Reserve Bank Governor Raghuram Rajan has repeatedly expressed concern over the health of public-sector banks, and pushed for steps to ensure that banks classify certain stressed assets as non-performing assets (NPAs) and make adequate provisions to “strengthen their balance sheets”, besides working out schemes of merger. With public sector banks sitting on over Rs 7 lakh crore stressed assets, including NPAs and restructured loans, Rajan recently said the estimates of NPAs being 17-18 per cent are bit on the high side and that entities should be careful not to treat NPAs as total write-offs but see if they can change promoters and repay as the economy recovers. He also said that some banks would have to merge to optimise their use of resources. Gross NPAs of public-sector banks rose to 6.03 per cent as of June 2015, from 5.20 per cent in March 2015. RBI has asked banks to review certain loan accounts and their classification over the two quarters ending December 31, 2015, and March 31, 2016. Editors Note: In response to the above story, published in The Indian Express on February 8, 2015, the Union ministry of finance, the Reserve Bank of India and the country’s largest bank, State Bank of India, have written back stating that the write-offs are an accounting entry to meet regulatory guidelines. Ministry of Finance: The fact of the matter is that write-offs are basically technical and are done within the framework of Income Tax Act, 1961 and RBI Guidelines regarding provisions for bad loans as per Standard Accounting Practices. Banks write-off advances at Head Office level as part of the balance sheet cleaning exercise and these loans continue to remain outstanding in the branch books. Recovery efforts continue to be made in the respective branches with respect to these bad loans. Write-off does not mean that recovery comes to a stop. Reserve Bank of India: ‘Writing off’ of non-performing assets is a regular exercise conducted by banks to clean up their balance sheets. Substantial portion of this write-off is, however, technical in nature. It is primarily intended at cleansing the balance sheet and achieving taxation efficiency. In ‘Technically Written Off’ accounts, loans are written off from the books at the Head Office, without foregoing the right to recovery. Further, write offs are generally carried out against accumulated provisions made for such loans. Once recovered, the provisions made for those loans flow back into the profit and loss account of banks. State Bank of India: We would like to point that SBI has a loan book of Rs 13,70,701 crore and the net NPAs are Rs 28,592 crore as on September 2015, which represent 2.14% of the advances. Standalone figures may appear big, however if you look at the overall size of SBI and its net NPAs, it can be seen that we are amongst the most efficient public sector banks in India. Moreover, our NPA figures have been improving over the last few years. It is pertinent to mention that SBI is 2.8 times larger than the next largest bank in the country in terms of business. Writing off a bad debt is an accounting entry to meet the regulatory guidelines. Writing off an amount does not mean it is a total loss as our legal team continues the recovery process and in due course recoveries are effected in the written off accounts, which are then added to the profits of the bank for that year. During the year ended March 2015, our bank recovered Rs 2,300 crores from the written-off accounts. We would herein like to add that for recovery, our legal systems and processes are most robust and reliable in the entire banking system. Our Correspondent replies: The report is based on a response from the Reserve Bank of India to an RTI application filed after the December 16, 2015, Supreme Court judgment, which said the banking regulator was bound in law to give information regarding private and public banks under the Right To Information Act. “RBI is supposed to uphold public interest and not the interest of individual banks. We have surmised that many financial institutions have resorted to such acts which are neither clean nor transparent. The RBI in association with them has been trying to cover up their acts from public scrutiny,” said a bench of Justices M Y Eqbal and C Nagappan. The RBI has noted that the total write-offs includes a large portion of technically written-off accounts where the recovery efforts continue as usual. Therein lies the problem. After a technical write-off, there is no incentive for banks to pursue recovery, as noted by RBI’s former deputy governor KC Chakrabarty in the past. Given the humongous bad loan problem at hand, the write-offs cannot be seen as just housekeeping. The Rs 1,14,000 crore written off over just the last three years (2012-13 to 2014-15) is more than the write-off over the previous nine years. So acute is the problem that both the Union finance ministry and NITI Aayog have separately pitched for setting up a government-owned asset reconstruction company to take over banks’ bad assets. Most importantly, write-offs force the government to commit large dollops of capital so that banks continue to undertake normal lending operations in the coming years. The finance ministry has proposed to infuse Rs 70,000 crore over the next four years, which may not be enough. Capital infusion by the government is always at the taxpayers’ expense. Setting aside moneys from the Budget for this only precludes higher allocation for critical sectors such as health and education.